Workaround: Set the clock to an earlier date on the client. Solution: Update the MBS server and client. 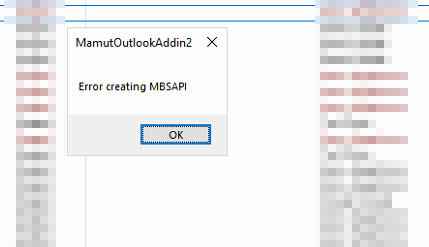 Faced with the error message “Error creating MBSAPI” when accessing the Mamut MBS Addin buttons for Outlook? 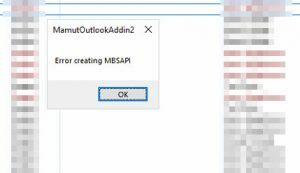 The issue is in relation the the API key validation performed by Mamut during for example initialization of the Outlook MBS Addin. It’s based on date, which has expired as you’re seeing the error. There is no supported way around the issue, other than a system upgrade to the latest version available. However, it’s possible to work your way around the issue by reverting the system clock a day or two followed by quickly performing the broken action prior to the client acquiring date and time settings from its NTP provider. This is of course not supported. This entry was posted in Troubleshooting and tagged Mamut, Windows. Bookmark the permalink.